Hello ... My name is Jesus. There are many ways to learn about Me. You can study how I lived, or My miracles, or My sermons, or the way I talk to people. You can see My full deity in the things I said, and you can also see my full humanity in the gospels. But I want to tell you about all My names, offices, titles, and pic­tures of Me in scripture. Each one gives a glimpse of who I am and what I do. When you put all of them together, you begin to grasp who I, the Son of God, am. Why are there so many names about Me? Because I am God. My many names reflect My many qualities, even then there are many things about Me you will never know. Remember, as God I am eternal ... omniscient ... omnipresent ... and omnipotent. These are qualities that humans can't comprehend ... measure ... or fully understand. You can never completely know Me because you don't have a divine mind to know all things. Only the Father and the Holy Spirit know Me completely and understand every aspect of My life. There are over 700 names-references to Me in scripture. Some of these are names I gave Myself, some are names given to Me by the Father, or the Holy Spirit. Other names are given to Me by humans who spoke under divine inspiration and/or direction by the Father or Holy Spirit. They spoke so people would know things about Me that were previously unknown. 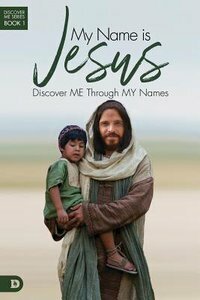 About "My Name is Jesus - Discover Me Through My Names (#01 in Discover Me Series)"